I believe that is exactly what Miss Athena is saying. Yes, you want to burn until it gets clear. If it does not burn clear after repeated attempts then I'd suggest having a reading done on the matter. Yes that's exactly what I meant. Thanks, Dr Darensbourg, for weighing in. Got your back, Miss A.
I have been practicing candle magic for a few years now and for the first time, I’m a little befuddled. Last week, I did daily cleansing work with candles and mopping and sweeping and baths. I burnt a white candle for seven days to purify my space and cleanse my feat based control issues. The candle burned clean and fully, no issues. On the new moon, I burnt a small black candle (not glass) with my intentions for the next six months. I also charged a green glass candle and a yellow glass candle and dressed them with oils. I am looking to increase my wealth by increasing my creativity and productivity. They burned fine for about 24 hours but when I awoke this morning, the yellow had gone out. there is no physical reason why— except the humidity is high in the house last night (70%). Green is still fine. My question is: do I let the green continue to burn with the yellow tied to it or is the yellow done and should be removed? Do I light the yellow again? I would expect either both or neither to go out so this confuses me as to what it means. To answer your question, this issue could be for a number of reasons. Humidity, possibly, a spiritual sign? Maybe. But it could also be the quality of the candle. When this has happened to me this has generally been the case. You failed to mention whether or not this was a lucky mojo product. If it is then we can more accurately guide you on what could have potentially went wrong and how best to use our products however we cannot and do not comment or make recommendations for products that we do not make. Thank you for your reply and moving it to the right forum— I wasn’t sure where it best belonged. It may be a quality issue: the green candle is yours but the yellow is from a local shop and was a last minute addition. Should I simply relight the yellow candle and decide it was not a spiritual issue, as it did not affect the green? Or leave it be? You could be very right. If it were me, I would say a quick prayer asking God/Spirit that the work continue on and be effective without any blockages and/or impedance. If it continues to go out I'd get rid of it and try another. I've been a creeper on the forum for years but recently come across something I've never seen before and I'm looking for help! I tried a forum search, Google searches, couldn't find this "issue" from anyone else. Any one who's experienced this or has some insight please enlighten me! So I was burning a Sacred Heart vigil candle, praying and petitioning my ex husband to fix his soul, return to God, follow the word of Christ, etc. I'll spare the long back story cause it doesn't seem necessary, but in short it was a positive, spiritual petition for his well being and for us to work productively as a family after our divorce (we have 2 small kids together). The candle burning went beautifully, strong flame that barely flickered, perfectly even, steady burn that did not leave even a pinch soot or a puff of smoke, just a small ring of wax at the end, everything perfect and clean except a TON OF WICK remains! What on Earth??? I wish I could upload a pic but I'm not sure how... But there is a good 3 to 4 inches of wick that doesn't even looked like it burned! No wax, just wick. The flame went all the way to the bottom until it went out, I didn't even realize the wick was still there until I took it down to observe the remains, it seemed to burn so perfectly. I would think with a wick that long still remaining the flame would have been all catywompus and left all kinds of black marks, but the glass encasement looks like I washed it, it burned so clean. Also, the petition seems to have been granted as my ex and I have been getting along very well the last few days and he's been making an effort to work on his spiritually. So has anyone experienced this before? It was the strangest thing to me! Thanks! As you probably know, we do not do candle divinations for folks on this forum, but we do reply to general questions about the traditional interpretations of candle remains. I interpret the unburned wick as a sign -- and an acknowledgement from the spirit to whom the candle was dedicated (in this case Jesus Christ) -- that you have the strength and power to continue the work, that this candle has not exhausted your ability to continue, that you have reserves of integrity and have not expended your core self in the shedding of this light. Thank you Cat for the insight! I too couldn't find any traditional interpretation and I appreciate your intuition and thoughts on it! Thank you for your advice. To follow up: the yellow candle went out AGAIN despite me clearing up any extra oils. But the green candle burned cleanly. The day it finished burning I recieved a sale and a gift and I am thinking perhaps the yellow for creativity went out because it needed no further work— I have been painting all week after a month of malaise. I have heard candles may burn quicker if the spell is working but perhaps in this case there was no need for a spell. Thank you! Since you said in an earlier post that the yellow candle came from another retailer instead of Lucky Mojo, we can't advise on the kind of experience you're having with it. I would stick to buying Lucky Mojo candles as you can therefore be assured that quality is not a concern, and could then reliably interpret your results. Congratulations on your sale and gift! I hope things continue to go well for you. I have a few questions about some candle work I have done. 1. I set a road opener candle for a job, it had a lot of soot but I put some of it down to putting a bit too much of the road opener oil on with the herbs, it burnt fast but there was wax left at the bottom. I also have another candle dressed with crown of success and steady job oil which is burning really slowly. Should I relight another road opener? I am concerned the steady job candle has a tiny flame. 2. I had a road opener and a blessings candle lit together. I also noticed a lot of black soot and a bit of wax left at the bottom of the road opener and the blessings candle. I cleansed and thought I should relight again but with a blockboster. The blockbuster for blessings is clear with a high flame but the road opener and blessings candle have a small flame and there are walls in both candles so they are burning like a crater and the blessings candle went out once. I prayed over it and relit it again. What should I do? First of all, are these candles you purchased from Lucky Mojo? As you know, we only advise on Lucky Mojo products on the forum, so we need to be sure. This will also rule out quality issues with your candles. Tiny flames are generally a sign of obstacles or resistance. A flame extinguishing itself may signify the work is not the right undertaking or that someone is working against you for this goal. There are a number of reasons for a candle to perform this way and it's impossible for us to tell you on the forum, as we do not do individual candle interpretations here. Best to stick with the good quality candles you can find at Lucky Mojo. Also, be sure to use only a little bit of oil, as that can drown out a wick. Sorry but we can't comment more on products bought from other retailers. I had a candle working I did for myself to draw in money (nor of lucky mojo), that started whistling like a tea pot. I had no clue what that meant. It got so loud at one point that it could be heard from another room. I wish I could download sound of it because I recorded it. Has anyone else had this happen and what would that mean??? If it helps to know I put it out with salt after it got so loud I was afraid it would break if I let I continue lol. That is an unusual occurrence; I personally have not heard of it happening before. Usually subtle noises such as cracks and pops are interpreted as communications from spirit but again, I've not experienced this so I'm in a poor position to say with certainty and the fact that it is not a Lucky Mojo product also presents another challenge in answering this question. This could be potentially be something with how the candle was manufactured so we definitely can't comment on what that would mean. Try using one of our products next time. I have moved your inquiry to a more appropriate forum for it although I suspect it may need to be in the Missionary Independent Spiritual Church forum. Unfortunately we do not provide divination or interpretations on the board. If you did indeed have the church set lights on your behalf and the questions you have pertain to a divination report that they sent you, then you'll need to contact them for clarification. Thank you Dr. Keith, I will do that. I had a run of 3 Road Opener candles lit for me at MISC, and after the final one ended with a "light white haze" I spoke to MISC and was told it should clear overtime with prayer (and my honey jar) so I moved on to light my Attraction candle at home. Candle burns can be effected by the burn environment. Such as a draft will make a dancing flame, a colder area a candle will burn slower then a hot warm area. Also, since you move the candle it will take away the ability to read it for signs. When the candle is moved it can cause the wax to move up and down, cause items in the candle to move ( herbs, glitter etc), and can cause it to leave rings or hazes. Best thing to do if you need to move it is simply keep burning them and not worry about the burn, but also back the work up with the church to give you those candle readings. I told MISC that I will burn this one at home and then get back to them if more are needed, so I'll call them after this one finishes. I always find the candles at my home very hard to read. I think I only ever had non-sooty glass at summer. The only time I had a sign I couldn't possibly ignore was once when the glass broke (and it burnt some of the plastic in my shower! Good thing I left it there). In that case, just use your candles at home to keep spiritual energy on a situation. If you want to do divination, and you can't help moving your candles around, then use MISC for divination. And you're right, snuffing and relighting can have an effect on the results, including soot. Out of curiosity, I cleaned the black soot to see if it happens again... but it hasn't so far as it's a bit warmer in the place today. I think it is very much the weather and movement in this case but I'll be ordering again at MISC after this burn finishes. NOT ASKING FOR DIVINATION. I just want to know if I am reading it properly. I am at the end of a reconciliation skull candle. It started off slow with a weak flame but when I began to play affirmations to it, the flame grew and even without them the flame stayed high. I put the petition in through the bottom and apparently close to the wick (not touching). Last night the petition lit and it's flame started to dance. They have now grown into one flame, with the original wick leaning toward the petition. The back and sides of the candle burned down much faster than the front until the flames grew together and now the remainder of the front is burning down much faster than before. I'm taking this all as a good thing. I have done skulls candle before and never had the back of ones head melt down like this. One question I do have is that it isn't considered a twin flame since it's not within the wick itself, correct? The back of the head rules instinctual matters -- the front is cognition and appearance. You are affecting his instincts faster than his appearance or his logial thoughts. No, it is not a twin flame. Hi Miss Cat. Does that mean I was affecting him on a sexual and/or visceral level? I recently did a Blockbuster to pull down any defense he had. Would I be correct in the change in the front of the skull burning faster down meaning that I did break that down finally? Thank you. IThe circumstances to me finding Hoodoo and fire magick are the results from a very hard year I wouldn't wish on anyone. It almost feels like a curse the losses I have endured in just 12 months. They have brought me to my knees but they haven't knocked me completely down. I'm a very strong woman and hearing my story, I get al ot of deer in the headlights look. From my employment to my family. The last year has changed everything I know and just shook me to my core. I was studying Hoodoo and still am, but I found myself drawn to fire magick. I have taken pictures..all without a flash, of a purple aura and a pink aura around my candles. I have wax images and beams from my candles also. During my meditation and thanks, the signs I get are reassuring from my candles. But with the good comes the bad. I have had 2 very disturbing experiences on my journey. So much so I did a cleansing twice. am looking for some guidance and possibly some answers to my fire magick. I have a question about the way my candle melted. The red Baphomet candle burned normally then I noticed the center of the candle appeared hollow. The wick remained lit and somehow it melted the back of the candle in a straight line down the back causing the candle to divide in half and one side (looking at the back, the left side) melted in a puddle with approximately 1/2 inch remaining. The side opposite remained standing, not like a craggy mountain but smooth almost retaining the original shape and the top melted outward like flower petals. Does this sound like a candle with a flaw or is this a sign of something? Hello Melinda and LkA01, and welcome to the Lucky Mojo Forum! Melinda -- This forum is the customer service outreach from our shop, it is not a place to receive free readings. We DO offer free readings on our weekly radio show podcast, but not candle readings, because the show is audio-only. 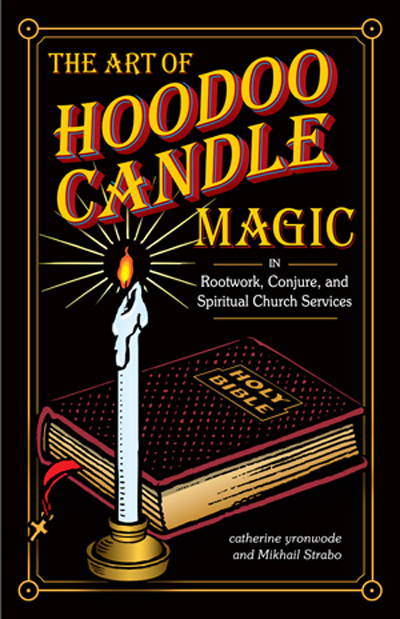 My book, "The Art of Hoodoo Candle Magic" does contain quite a lot of information on candle divination. LkA01-- Sorry to hear of all the troubles you have been experiencing, and i hope that things get better soon. This forum is for practitioners of hoodoo and for customers of our shop (we teach people how to use the products we make), so we really cannot help you with fire magic. However, since it seems that some of the fire work you are doing involves candles. The best i can offer you in that regard is the book i wrote about candle magic. It may open some doors for you. I have been lifting a candle in my honey jar every night since last Wednesday. I plan on lighting 7 days in a row then MWF for the next few weeks or until my deadline is met. But I was wondering if anyone had used the wick position as a sign? Every night I light the candle the wick would be straight or very slightly leaning. About a minute or two into the burn, it curls slightly to the right ( if I'm facing it, my right). It has done this every night except one. That may have been the second night. It's a reconciliation jar. I have a picture of us together on my alter next to the candle on the side the wick always curls or bends. Anyone else notice anything lime this in their work? How a candle behaves during a spell may indicate messages, but may also be the result of mundane things like the room's temperature, breezes or the candle's construction. You are doing the correct thing by experimenting with moving the photo, to see if this is a sign or a coincidence. Well done for thinking that through.